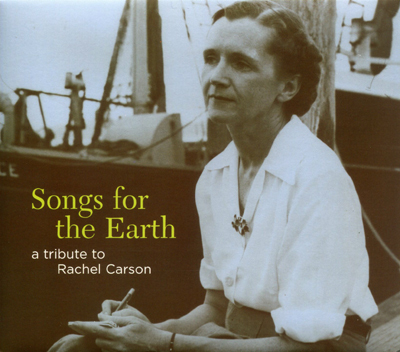 Songs for the Earth – A Tribute to Rachel Carson has 17 outstanding pieces, several written exclusively for this collection. The songs were inspired by Rachel Carson’s vision, and the performances were donated by their artists with a generosity of spirit that has touched our hearts. Pete Seeger, Walkin’ Jim Stoltz, Steve Schuch, Kat Eggleston, Bill Oliver, Tom Vincent, Betty and the Baby Boomers, Casey Neill, Dean Stevens, Cindy Kallet, Tom Paxton, MAGPIE, Tish Hinojosa, Gordon Bok, Emma’s Revolution, Bob Zentz, and Josh White, Jr. The CD is a joint project involving two non-profit environmental organizations, Rachel Carson Council, Inc., and Musicians United to Sustain the Environment (MUSE). It would not have been possible without the dedicated efforts of MAGPIE. The project was funded through a grant from Eugene B. Kahn. Proceeds from the sale of the CDs will go towards furthering the work of both non-profit organizations. Songs for the Earth is not available as a download. CD ships USPS.